cv. of nutans x (distachia x nutans) by Giridlian. A case of misidentity? With these parents you would not expect this description of a large plant by Padilla. Plant grown in Australia in the 1970's called 'Elvenia Slosson' but closer to what you would expect for 'Leodiensis' ( nutans x vittata)! Click here for Detective Derek 07/10 notes. 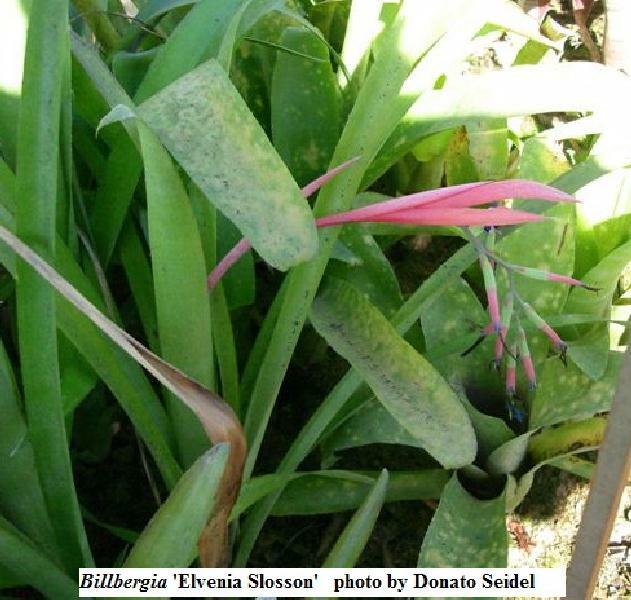 James N. Giridlian, of Oakhurst Gardens in Arcadia, California, has made a number of noteworthy Billbergia crosses. One of his first is B. x'Elvenia Slosson', named in honor of a prominent garden club leader. This is an exceedingly graceful Billbergia, with very long, strap-shaped deep green leaves, which turn purplish bronze in the sun. The attractive inflorescence with its bright red bracts and deep purple flowers may measure from 24 to 36 inches. This Billbergia makes a handsome pot plant. 'Elvenia Slosson' Giridlian (B. nutans x B. albertii?). The very long, strap-shaped, dark green leaves turn purplish bronze in the sun. The bracts are bright red; the petals, deep purple. The flowering plant is about 3 feet high.